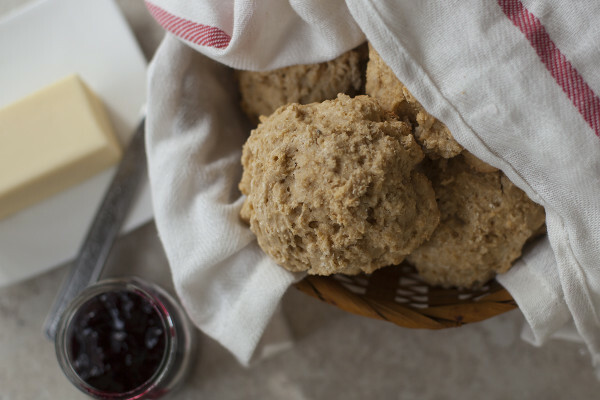 These whole wheat drop biscuits are light and fluffy, with all the goodness of whole grains. A perfect breakfast, edible gift, or side dish. Biscuits are the clouds of the bread family. Light and fluffy pillows of dough are baked until golden. Soft and tender on the inside, with a crispy, flaky exterior that crunches delightfully when you bite into it. Is there really anything better than homemade biscuits? But these biscuits are even more appealing, because they’re made with healthy whole wheat flour. In fact, just one of these biscuits provides two complete servings of whole grains! 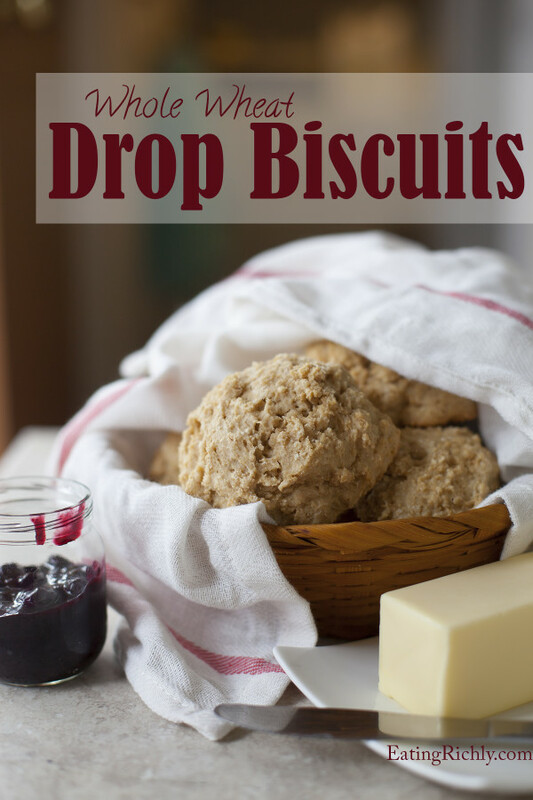 While I love the rustic look of drop biscuits, I really make them because they’re so ridiculously easy. You simply mix your ingredients, plop the dough onto a cookie sheet, and pat down any raggedy bits. No kneading, rolling, or cutting. Simple. Convenience is the language of nursing mamas, and these biscuits are one of my favorite breastfeeding snacks. I’ll slather one with peanut butter for a fast and healthy breakfast, or butter and honey for an afternoon snack. These biscuits are also a family favorite for a quick dessert. I always have some sort of homemade jam, conserve, compote, or syrup in the fridge, so we simply slice a hot from the oven biscuit in half, spread it with a little butter, and drizzle it with whatever fruit concoction we have on hand. If you’re on a dairy free diet, these biscuits are easy to adapt. I have tried both soy milk and almond milk to great success. Each one lends a different flavor, so play around with it. I do recommend using unsweetened milks though, as the biscuits are sweet enough on their own. Finally, let’s talk about cost. These biscuits cost me so little to make, it’s not really surprising that I make a batch once a week. I buy organic soft white wheat berries from Azure Standard to turn into whole wheat pastry flour. I love the freshness and convenience of grinding my own flour, but if you don’t have a grain mill, I highly recommend the Bob’s Red Mill organic pastry flour. The Amazon price is only 3 cents more per ounce than the great deal I get on wheat berries from Azure. What’s your favorite way to eat biscuits? 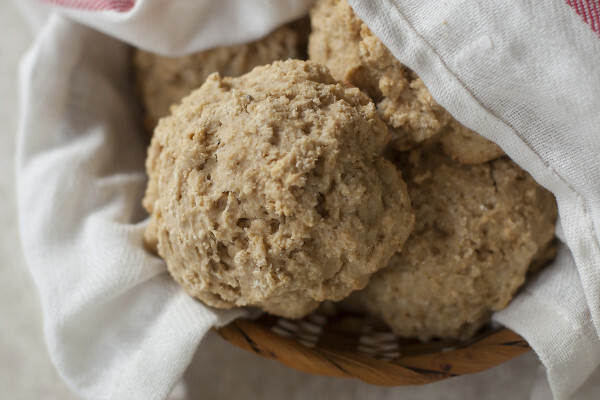 These whole wheat drop biscuits are healthy, fast, simple, and provide two complete servings of whole grains. Preheat oven to 350 degrees F and grease a cookie sheet with the cooking spray. In a glass measuring cup, mix your milk and vinegar. In a large bowl, whisk together the flour, sucanat, salt, and baking powder. Stir in the melted butter and the curdled milk. You should have a goopy dough that is just firm enough to hold it's shape. 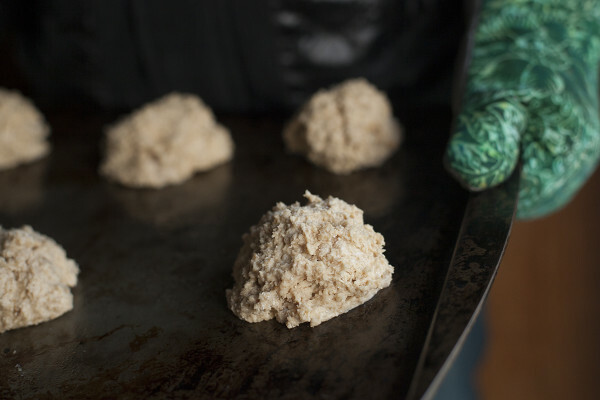 Scoop up big spoonfuls of dough and drop them onto your greased cookie sheet. Bake for 20-25 minutes, until biscuit tops are just turning golden. Approximate cost/serving: These biscuits only cost me about 90 cents to make. That means a measly 15 cents per serving! Vegetarian: These are easily made vegan by using a non dairy milk and coconut oil. If you use coconut oil instead of salted butter, I recommend an extra pinch of kosher salt. Earlier today I made some whole wheat drop biscuits using only two tablespoons of flax meal as the source of oil…truly low fat. Applesauce was used as a fat replacer.